Note: Visio does have some polygon shapes. But they only provide three to eight sides. 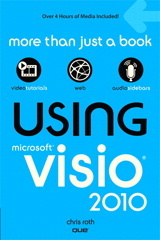 You can find them here: File > Shapes > Visio Extras > Drawing Tools. The masters are called: Multigon Edge and Multigon Center. You can change the number of sides by right-clicking the shapes and choosing from the menu. The download that accompanies this post is more flexible in that it uses VBA code to create brand-spankin’ new shapes. 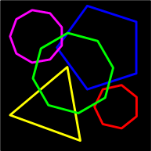 This code, of course, allows you to create polygons with any number of sides. The drawing has a Visual Basic for Applications (VBA) project inside it. You’ll have to enable macros, and allow them to run in order for the Polygon Maker to function. Under Tools > Macros > Security, set your macro protection level to Medium. This allows you to enable or disable VBA macros to run when you open the drawing. The first time you open a drawing from a little-known source, simply click the Disable Macros button that appears in the pop-up dialog. Hit Alt + F11 to open the VBA project. Examine the various modules to make sure there’s no code that deletes your Windows installation or formats your hard drive. Once you believe that the code is on the up-and-up, you can reopen the .vsd and click Enable Macros. Now you’ll get the full benefit of the code behind the drawing! I won’t post all of the code here, but just some of the key bits. We’ll ignore all the UI stuff and just post the portion that creates the Visio shape, with its geometry sections. You can below see that DrawShape takes two arguments. One simply specifiec the number of sides in the polygon, the other specifies the radius of the circle in which the polygon is circumscribed. The radius value is in inches, so you metric folks need to multiply by 25.4 if you want think in millimeters. just what I needed …. 2. Go to: Shape > Operations > Fragment. This will create a “dumb” shape that you can freely resize, but the ability to change the number of sides will be lost. Visio Guy, you saved me a lot of time with this very neat macro!! I don’t often need 11-sided shapes, but when I do, it’s usually for a rush job and no time for manual fiddling! I am using Visio 2013 (Build 15.0.4841.1002) and it is not closing off the shape correctly. I know it was written back in 2006, any chance you could look at it and fix? Also, any chance you could add connection points on each ‘corner’ – that would be awesome.